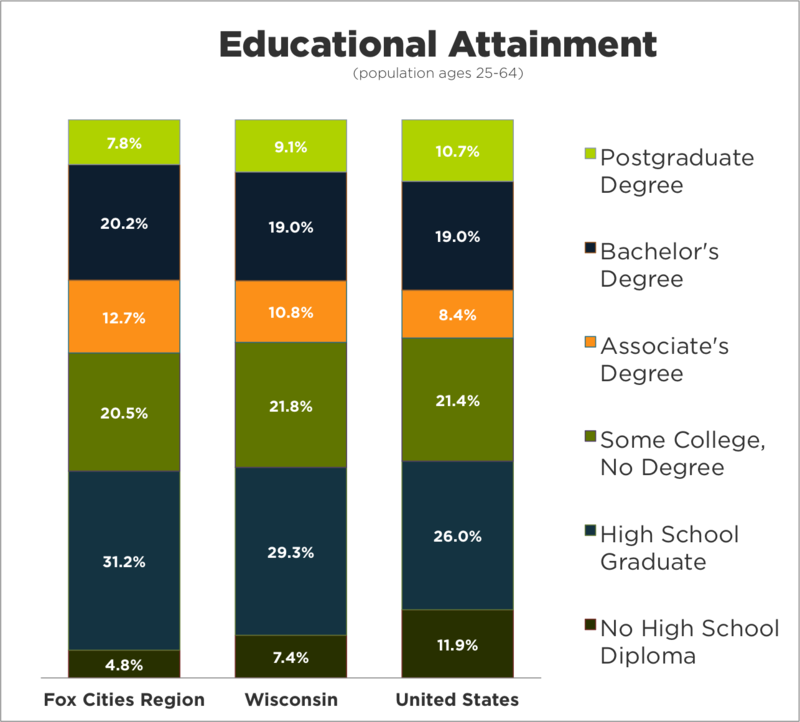 Our educated population and the quality of post-secondary education is one of the things that attracts business leaders to the Fox Cities Region. The Fox Valley Technical College, for example, is a nationwide leader in providing employee education and training. There are 18 colleges and universities within an hour’s drive of the Fox Cities Region. Many are designed with working adults in mind. Here are some of the closest. Fox Valley Technical College (FVTC) is a nationwide leader in providing employee education and training, offering degrees in more than 200 programs. FVTC works with businesses of all sizes to deliver customized training solutions and advance applications in areas including transportation, security/crime prevention, health care, entrepreneurship, small business development, manufacturing and customer service, sales and marketing. University of Wisconsin–Oshkosh with approximately 13,500 students UW-Oshkosh is among one of the largest public universities in the state. It offers 60 undergraduate degrees, 17 master’s degrees, and 1 doctoral degree. University of Wisconsin–Green Bay offers a multitude of undergraduate and graduate level courses. University of Wisconsin–Fox Valley offers associate degrees as well as collaborative degree programs in engineering, organizational administration and American Studies. St. Norbert College (De Pere) is a top-ranked Catholic liberal arts college. For more information on the colleges and universities in and around the Fox Cities Region, please contact us.